Setlist: They kept the Canadian setlist, except they added Leaves of Green, dropped America, Nou Sommes du Soleil and Owner (!) and moved YIND to where America had been. Otherwise, the band performed the songs a bit more briskly and cut the between song chatter to fit setlist into a 2 hour time slot. I liked that. It created a bit of a "Yessongs" vibe. Steve: played very well, but not perfect. He nearly floored me by bringing his Gibson L-5 Switchmaster out to perform Roundabout and Lon Distance Runaround--this guitar was used to record the studio versions, and I didn't think he had brought this guitar out to tour with since the early-70s--it's rare, valuable and beautiful. Igor: blew me away! He IS the Yes keyboardist of the future. BTW, his CTTE tops that of Moraz and the ABWH/KTA Wakeman hands down. His energy and enthusiasm were a highlight of the show. Rhythm of Love: is, oddly enough, now another highlight of the show. Steve plays steel throughout the song, and the ending jam is so good I could easily listen to it by itself without the rest of the song. It really has improved since last fall. Touring appears to have improved Billy's soloing--he held his own here with Steve and Igor, but it was his only solo spot of the night. Lack of new songs: not a problem. The band's run through of "OYE" was so lackluster and forced that I'm glad they didn't play anything else off of OYE. Mind Drive would have been nice, though. Surround Sound: Was used in a subtle and effective way throughout the set. In particular, YIND and CTTE benefitted from the addition of two rear channels. Alan Parsons: a decent set. BTW, he does use the surround sound system also. Interestingly, like Billy, Alan Parsons just strums along and sings backups...which is funny since Alan is the "name" guy. The bottom line: being in a bigger venue took away some of the drama and intensity of the theater shows, but I really enjoyed the show. For those whining about the static setlist, just go to the show!! Even if you've seen these songs, they are still really enjoyable because they are *performed well*, unlike some other recent Yes tours. Think about it, a few years ago many of us wouldn't have believed that we would get to see such a Yes show ever again. So I, for one, am not going to complain a bit!! An enthusiastic, full house greeted YES on a hot, steamy Virginia Beach evening and the band clearly fed off the energy and performed with abundant youth and vigor. If there was a downside at all to the evening, it is that this set list needs to be updated and re-freshened. Still, if this concert is any indication of what they will do on this tour, then it will be well worth the price of the ticket to catch them. A good 5000+ crowd went away, by all indications, most satisfied. Alan Parsons Project opened the show on time. This was their first US tour date with Yes and it will take a little while for sound systems and the band to gel. Surprised they didn't play some of their earlier, electronic-oriented sound that would have been familiar to some of this crowd. They played their few recognizable hits, but I was personally a little disappointed. 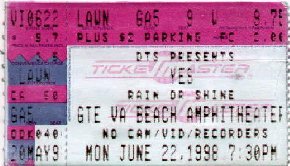 YES was greeted with lots of energy and appreciation and it was clear from the first notes of "Siberian Khatru" that this was a classic Yes audience primed for the early material and that they were going to be on every lyric and chord change of the night. The band came out looking refreshed and dressed with exuberance; Steve Howe wore a multi-pastel-colored jacket worthy of another era and even Igor had a day-glo checked shirt that radiated the 70's under the occasional bathing of ultra-violet ("black-light") lighting. Chris wore a long cloaked jacket that revealed the Yes logo (of latter-day YesYears style) on his back when he turned around and faced his bandmates. Jon's voice had that early tour resonance-- crystal clear and strong-- and he remembered all of his lyrics, from what I could tell. The guys really got behind the only Rabin-era material of the night ("Rhythm of Love") and it was better than what I heard and saw on 1997's tour. Howe got into it and it sounded as good as it ever did, although I still miss Rabin "twisting" his notes in this song. They skipped "America" (which was alright with me-- one tour of that is enough) and went right to "Yours Is No Disgrace" which pleased the audience and I thought was well placed in the line-up. The energy remained high. The ONLY new song in the show-- in fact, the only one from the last DECADE, and one of three for the past twenty-five years (!) was "Open Your Eyes." I don't know how other Yes fans feel about the later stuff, but this is tight, new-day Yes at its best-- it has the crisp hooks of a "Going for the One" and the vibrant harmonies that gave the 90125 material that fresh sound in the early eighties. I like this song and album very much-- whereas other bands (like Alan Parsons and the Fixx, both of whom I saw in the last ten days) play too much of their new stuff and not enough of the old, Yes is just the opposite. This show is clearly a Yes Album-Fragile-Close to the Edge program-- I mean I like CttE, but playing the whole album at the expense of virtually ANYTHING from "Going for the One," "Tormato," or "Drama"? There was some pretty great stuff off of those albums and the four mainstays (except for Anderson on "Drama") created that music too, and they sold well... so why not play something from those LPs? I can understand not playing much from the Rabin-Kaye era-- but the over-accentuation on pre-1973 Yes is imbalanced and these guys have got to change that for the fans. "New State of Mind" is another new, solid Yes rock song that's perfect for in-concert... where's that fresh material in the line-up? Even the acoustic "From the Balcony" which they occasionally played on the last tour, should have been included.